IT'S TOFFEE'S TURN: IS ROSMAH VYING THE WANITA HEAD POSITION IN UMNO? Has Rosamh designs for Sharizat's position in UMNO? Now with Najib's resignation from UMNO is Rosmah mansor going to attempt a Hilary Clinton, Malaysian style? Can she lead Wanita UMNO? Of late Rosmah has been trying to grab the limelight again, with statements via the press asking the Police investigating the 1MDB scandal to stop leaks about the bags, jewelry and cash confiscated during the raid. to that effect to have come from Najib Tun Razak, but here it was Rosmah still talking down to the cops. "Despite the overwhelmingly trying times afflicted upon us, we have, and will continue facilitating, and avail ourselves to any requests." “However, we would like to bring to attention about the seemingly compromised inquiry process, whereby a series of leaks pertaining to the probe has made its way into social media spheres, in real time, enforcement agencies should not be feeding social media trolls, but observe and uphold strict professionalism at all times,” she is reported to have said.. In an exclusive interview with the UMNO owned Malay Mail she expressed doubt the current Pakatan Harapan (PH) administration would continue her Permata programme. "Accompanied by her lawyers, Datuk Geethan Ram Vincent and M. Puravalen and this was her first press interview since the BN lost the 14th general election and law enforcement agencies began investigating her family over 1MDB. In an immediate response to Rosmah's call for the continuation of Permata Face book users suggested that whatever the government decides to do with Permata, they should first conduct a complete audit of the body. The Deputy PM has also come out saying that may continue with Permata but needed to conduct an audit of the body first. Najibs is always "Press Shy," especially in controversial issues and more so with 1MDB, on the other hand Rosmah loves the limelight and feels she has the ability to handle the press. Two of UMNO's branch leaders , whom I met yesterday told me, this, "don't write Rosmah off, we really do not know the impact she can create on UMNO, and she may just go for Sharizat's post." Well I shared this statement with my friends and all seem to agree that this is most certainly a possibility as with Rosmah you really never can tell. Will Rosmah go for the position of Wanita head and possibly eye the Presidency in UMNO to attempt to be the first woman PM in Malaysia to outdo Dr. Wan Azizah? Well you really can't tell but the more people I talk to the more are convinced that she is capable of giving it a shot. Are Umno ppl really serious? Do they really want to revive Umno or they have actually decided to bury it for good? I mean.... Rosmah for Wanita Head? 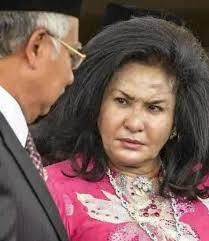 Rosmah- the Imelda Marco 2.0 ???? ?